Zachary Israel Braff (born April 6, 1975) is an American actor, director, screenwriter and producer. He is best known for his role as J. D. on the television series Scrubs (2001–2010), for which he was nominated for the Primetime Emmy Award for Outstanding Lead Actor in a Comedy Series in 2005. In 2004, Braff made his directorial debut with Garden State, which he also wrote, starred in, and compiled the soundtrack album for. He shot the film in his home state of New Jersey for a budget of $2.5 million. The film made over $35 million at the box office and was praised by critics, leading it to gain a cult following. He won numerous awards for his directing work and also won the Grammy Award for Best Soundtrack Album in 2005. Braff directed his second film, Wish I Was Here (2014), which he partially funded with a Kickstarter campaign. Braff appeared on stage in All New People, which he wrote and starred in. It premiered in New York City in 2011 before playing in London's West End. He also played the lead role in a musical adaptation of Woody Allen's Bullets Over Broadway in 2014. Braff was born in South Orange, New Jersey. His father, Harold Irwin "Hal" Braff, is a trial attorney and graduate and professor of Rutgers Law School, and his mother, Anne Brodzinsky (born Anne Hutchinson Maynard), worked as a clinical psychologist. His parents divorced and remarried others during Braff's childhood. One of his siblings, Joshua, is an author. Braff's father was born into a Jewish family, and Braff's mother, originally a Protestant, converted to Judaism before marrying his father. Braff said that he had a "very strong Conservative/Orthodox upbringing." He had his Bar Mitzvah at Oheb Shalom Congregation. In 2005, he stated that he was "not a huge organized religion guy," and in 2013, he said that "the religion doesn’t necessarily work for me," although he identifies as Jewish. Through his mother's New England ancestors, Braff is a ninth cousin of 2012 Republican presidential nominee Mitt Romney. Braff has wanted to be a filmmaker since his early childhood, and has described it as his "life dream." Braff was diagnosed with obsessive-compulsive disorder at age ten. During his childhood, Braff was a friend of future Fugees member Lauryn Hill at Columbia High School, in Maplewood, New Jersey. Braff also attended Stagedoor Manor, a performing arts "training center" for youth actors ages 10 to 18. It was there that he won an acting award and had his first kiss. Stagedoor is also where Braff met actor Josh Charles, who is still a friend. Braff also knows Stagedoor alums Natalie Portman, Mandy Moore, and Joshua Radin. Braff attended the Northwestern University School of Communication, where he became a brother of the Phi Kappa Psi fraternity, and graduated in the class of 1997. One of Braff's earliest roles was in High, a proposed 1989 CBS television series with a cast that also included Gwyneth Paltrow and Craig Ferguson; the television pilot never made it on air. Braff appeared in the 1990s series The Baby-sitters Club, in an episode titled "Dawn Saves the Trees." He appeared in Woody Allen's 1993 film Manhattan Murder Mystery. In 1998, Braff had a part in a George C. Wolfe production of Macbeth for New York City's Public Theater. Braff played "J.D." (short for his full name of John Dorian) on the medical comedy TV series Scrubs which debuted in 2001. The role was Braff's first major role in a television show. Braff was nominated for three Golden Globes and an Emmy for his work on the show. Braff directed several episodes of Scrubs, including its one-hundredth, "My Way Home." For the show's ninth season, Braff was a cast member for six episodes and also served as one of the executive producers. Braff directed several episodes of Scrubs. Braff wrote, directed, produced, and starred in 2004's Garden State, which was filmed in his home state of New Jersey. Producers were initially reluctant to finance the film, which Braff wrote in six months. At the 2005 Grammy Awards, his "mixtape" won a Grammy for Best Compilation Soundtrack Album for a Motion Picture, Television or Other Visual Media for the Garden State soundtrack. On April 24, 2013, Braff started a Kickstarter campaign to finance the film Wish I Was Here, based on a script he wrote with his brother, Adam Braff. The goal of $2,000,000 was reached in three days. He directed and starred in the film, which was released in 2014. Braff was the executive producer of the documentary Video Games: The Movie. He was also one of the Executive Producers of The Internet's Own Boy: The Story of Aaron Swartz, released in 2014. He has directed several music videos: Gavin DeGraw's "Chariot," Joshua Radin's "Closer" and "I'd Rather Be With You," Cary Brothers' "Ride," and Lazlo Bane's "Superman," the theme song from Scrubs. His music production has resulted in newfound success for some of the artists featured on his film soundtracks, such as The Shins, who were prominently featured on the Garden State soundtrack and the Scrubs soundtrack, resulting in the expression "the Zach Braff effect." He also voiced the titular character in the Disney animated film Chicken Little (2005), and has reprised the role in various Disney video games such as Chicken Little, Kingdom Hearts II, Chicken Little: Ace in Action and Kingdom Hearts 2.5 HD ReMIX. Braff has also done voiceovers for commercials, including a PUR water campaign, Wendy's in 2007 and 2008, and in Cottonelle as the voice of the puppy. He also provided the voice of Finley in the Disney film Oz The Great and Powerful (2013). In 2005, Braff was featured on Punk'd when he was tricked into chasing and then beating a supposed vandal who appeared to be spray-painting his brand new Porsche. Braff was in talks to star in the film Fletch Won and had signed on to play the role eventually played by Dane Cook in Mr. Brooks, but dropped out of both roles to work on Open Hearts, which he adapted from a Danish film and will direct. He has also co-written a film version of Andrew Henry's Meadow, a children's book, with his brother, and was scheduled to direct one of the segments for the film New York, I Love You. In July 2009, he signed on as an executive producer for the documentary Heart of Stone to "help spread the word about it." Braff starred in the romantic drama The Last Kiss, which opened on September 15, 2006. Braff tweaked several parts of Paul Haggis' script for the film, as he wanted the script to be as "real as possible" and "really courageous" regarding its subject matter. As with Garden State, Braff was involved with the film's soundtrack, serving as executive producer. The film's director, Tony Goldwyn, compared Braff to a younger version of Tim Allen, describing Braff as "incredibly accessible to an audience... a real guy, an everyman." In 2007, Braff starred in the film The Ex (2007), which he has described as a "silly comedy." Braff starred in the Canadian indie film The High Cost of Living with Quebec actress Isabelle Blais in 2010. Directed by Deborah Chow, the film was shot in Montreal and principal photography wrapped on March 9, 2010. Braff stated he enjoyed filming in the country in which The Last Kiss was also shot. The film premiered at the Toronto International Film Festival and was also shown at the Tribeca Film Festival. Braff returned to the Public Theater in 2002, in a part in Twelfth Night, staged in Central Park. In mid-2010, Braff took a lead role in Trust, at the Second Stage Theatre, a contemporary Off-Broadway theater company. The play ran from July 23 to September 12, extending its scheduled run by one week. Braff wrote on Facebook that he was "Having so much fun doing Trust." The play co-starred Sutton Foster, Ari Graynor and Bobby Cannavale, was written by Paul Weitz and directed by Peter DuBois. Braff played Henry, a wealthy married man who "looks to find something real in the most unlikely of places." In early 2011, Braff announced that he had written a play to be performed at the Second Stage Theatre in mid-2011. The play, All New People, is set on Long Beach Island and centers on Charlie, a 35-year-old from Braff's home state New Jersey. The play was directed by Peter DuBois, who directed Braff in Trust the previous year. When announcing the play on Facebook, Braff wrote that 'one of my dreams comes true'. In 2012, Braff moved the play on tour to the UK, playing in Manchester at the Manchester Opera House between February 8–11, Glasgow at the King's Theatre between February 14–18, and finally in London for 10 weeks at the Duke of York's Theatre from February 22. On April 10, 2014, Braff opened on Broadway in the musical Bullets Over Broadway The Musical, an adaptation of Woody Allen's 1994 film, directed and choreographed by Susan Stroman. Braff at the 2010 Toronto International Film Festival. Braff's is expected to direct Open Hearts, a remake of the 2002 Danish film Elsker dig for evigt (Love You Forever). The film is about a woman who has an affair with her paralyzed husband's doctor, whose wife caused the accident that put her husband in a wheelchair. It was first revealed that Braff was directing Open Hearts in 2006, however, the movie was cancelled. Braff said "It fell apart at the last second due to scheduling and budget, as so many movies do." At the same time, Braff's film The Last Kiss was being released. In 2009, Braff was working on the script for Swingles, a film based on a spec script by Duncan Birmingham; he will direct and star in alongside Cameron Diaz. In 2009, Braff opened up the restaurant Mermaid Oyster Bar in New York City with chef and high school friend Laurence Edelman, as well as Danny Abrams. Proprietors of the Rio Theater in Monte Rio, California credited Braff with making the donation that put their Kickstarter campaign over the target to buy a digital projector over its $60,000 goal in May 2013. Braff's father Harold was a New Jersey attorney and among the founders of the state's American Inns of Court (AIC) and an elected trustee of the National Inns of Court Foundation. He was widely recognized for furthering standards of excellence in the practice of law. Together with Braff's stepmother, marriage and family therapist Elaine Braff, he also taught PAIRS marriage and relationship education classes. His brother, Joshua Braff, is an author; his other brother, Adam Braff, is a writer and producer; and his stepsister, Jessica Kirson, is a New York-based comedian. Braff began dating singer and actor Mandy Moore in 2004. They ended their relationship in 2006 after two and half years of dating. In Episode 4.3 of the MTV show Punk'd, which aired on March 20, 2005, Braff was filmed yelling at a teenaged actor. He unwittingly appeared on the show at the behest of his Scrubs co-star, Donald Faison, who pranked Braff by having an actor spray-paint Braff's new Porsche with fake paint. Braff pursued and caught the teen actor and tried to punch him in the stomach; this was edited out of the episode. Braff later discussed it on Dax Shepard's podcast, Armchair Expert, that Braff had realized something was going on, so put on a show, however never punched the "teen," who was actually an adult actor. In November 2008, Braff earned his pilot's license flying a Cirrus SR20. Braff, a Democrat, endorsed the re-election campaign of President Barack Obama. He has accused Republican politicians of lying, saying "What is frustrating is the lying. I know every politician spins the truth a little, but when you happen to know the facts and you see Paul Ryan's speech you are like 'Wait a minute. So much of that is not true.'" 1990 The Baby-Sitters Club David Cummings Episode: "Dawn Saves the Trees"
1994 CBS Schoolbreak Special Tony / Tammy Episode: "My Summer as a Girl"
2009 Scrubs: Interns John "J.D." Dorian Episode: "Our Meeting with J.D." Episode: "A One Story Town"
2012 The Exes Chuck Feeney Episode: "He's Gotta Have It"
2014 Inside Amy Schumer Rob Episode: "I'm So Bad"
2017 Bill Nye Saves the World Himself Episode: "Earth is a Hot Mess"
2017 BoJack Horseman Himself (voice) Episode: "Underground"
^ "Zach Braff". TVGuide.com. Archived from the original on April 1, 2014. Retrieved April 29, 2014. ^ "Zach Braff | Television Academy". Retrieved 2016-08-16. ^ "Garden State – Trailers – Movie Reviews". RottenTomatoes.com. Archived from the original on July 1, 2010. Retrieved April 5, 2010. ^ a b "Kickstarter campaign for Garden State sequel". 3 News NZ. April 25, 2013. Archived from the original on May 8, 2014. ^ Isherwood, Charles (2011-07-26). "'All New People,' by Zach Braff - Review". The New York Times. ISSN 0362-4331. Retrieved 2016-08-16. ^ Who's who in American Jewry. Standard Who's Who. 1980. p. 60. ^ Mottram, James (September 19, 2014). "Zach Braff interview: Scrubs star on 'pushing 40' and his new film Wish I was Here". The Independent. Retrieved May 19, 2018. ^ a b Dawson, Angela (September 6, 2006). "Braff's 'Kiss'". AZ Central. Retrieved May 24, 2007. ^ a b c Bloom, Steven M. (July 15, 2004). "Back in the 'Garden State'". New Jersey Jewish News. Archived from the original on December 10, 2013. Retrieved May 24, 2007. ^ "Zach Braff Biography (1975–)". Filmreference.com. Archived from the original on December 10, 2013. Retrieved April 5, 2010. ^ Kupfer, Ruta (November 24, 2008). "'Scrubs' Star Zach Braff Falls in Love With Tel Aviv". Haaretz. Retrieved May 19, 2018. ^ Joseph, Anne (February 2, 2012). "Interview: Zach Braff". The Jewish Chronicle. Retrieved May 19, 2018. ^ Wiener, Robert (May 18, 2017). "Hal Braff honored for devotion to black and Jewish communities". New Jersey Jewish News. Retrieved May 19, 2018. ^ "Q&A with Zach Braff". Schmooze Magazine. Archived from the original on December 10, 2013. Retrieved March 9, 2013. ^ Schleier, Curt (March 27, 2018). "Zach Braff is happy to be back on TV. 'Scrubs' fans should be, too". JTA - Jewish news. Retrieved May 19, 2018. ^ Kepnes, Caroline (November 14, 2005). "Shmoozin' with Zach Braff". Hillel. Archived from the original on February 1, 2014. Retrieved November 4, 2010. ^ Goldenberg, Anna; Cohen, Anne (July 8, 2014). "Zach Braff's Jewiest Movie Yet". The Assimilator. Forward.com. Retrieved September 7, 2015. ^ Zeitchik, Steven (July 30, 2011). "Zach Braff stages a career move". Los Angeles Times. ^ a b Matthews, Dana. "Zach Braff Is Not Ashamed of His Theatre Geek Past". Vanity Fair Online. Archived from the original on December 17, 2013. Retrieved May 1, 2012. ^ Healy, Dara (March 1, 2012). "Zach Braff and Mitt Romney 'related through a witch'". Storyful.com. Archived from the original on March 11, 2013. Retrieved March 9, 2013. ^ "Jewz in the Newz". The American Israelite. March 14, 2012. Archived from the original on July 8, 2012. Retrieved March 9, 2013. ^ "Romney Gains Momentum As He Keeps On Running | News | The Harvard Crimson". www.thecrimson.com. Retrieved 2018-07-25. ^ "The next Woody Allen? – Film". www.smh.com.au. November 26, 2004. Archived from the original on December 9, 2013. Retrieved April 5, 2010. ^ "Zach Braff on Twitter". Retrieved November 8, 2018. ^ "Notable Alumni". Northwestern University School of Communication. Archived from the original on March 18, 2014. Retrieved March 21, 2013. ^ "Gwyneth Paltrow's Forgotten Pilot". ETonline.com. Archived from the original on June 17, 2013. Retrieved March 9, 2013. ^ TV.com (March 12, 1990). "The Babysitters Club – Season 1, Episode 11: Dawn Saves the Trees". TV.com. Archived from the original on October 22, 2013. Retrieved March 9, 2013. ^ a b Oxfeld, Jesse (August 2011). "Zach Braff's Theater Debut". Observer. Archived from the original on November 5, 2013. Retrieved March 9, 2013. ^ "Zach Braff Emmy Nominated". Emmys.com. Archived from the original on May 30, 2013. Retrieved March 9, 2013. ^ "Bill Lawrence: Judy Reyes won't appear in season nine, and other Scrubs news". TVSquad.com. Archived from the original on January 29, 2010. Retrieved October 16, 2009. ^ "60 SECONDS: Zach Braff". Metro.co.uk. October 19, 2006. Archived from the original on December 12, 2007. Retrieved May 9, 2007. ^ Fogleman, Chelsea (March 3, 2008). "McMainstream: The Evolving Independence Of The Music Scene". Starpulse.com. Archived from the original on October 14, 2013. Retrieved March 9, 2013. Zach Braff's self-described 'mixtape' that-went-on-to-win-a-Grammy got music lovers humming Frou Frou, Iron & Wine, and The Shins almost overnight. ^ a b Erstein, Hap (September 10, 2006). "Goodbye, Scrubs?". The Oxford Press. Archived from the original on March 9, 2007. Retrieved May 9, 2007. ^ "Kickstarter page of WISH I WAS HERE project". kickstarter.com. Archived from the original on April 29, 2014. ^ Franich, Darren (April 27, 2013). "Zach Braff's Kickstarter movie reaches $2 million goal". Archived from the original on August 30, 2013. ^ "Zach Braff Raises over 2 million on Kickstarter for "Garden State" Sequel". Archived from the original on October 14, 2013. ^ "Zach Braff-Produced Doc 'Video Games: The Movie' Nabbed by Variance Films". Retrieved July 20, 2014. ^ "The Internet's Own Boy: The Story of Aaron Swartz (2014) - Full Cast & Crew". Internet Movie Database. ^ Braff, Zach (March 21, 2005). "Warning: Not Funny!". Zach Braff's Garden State Blog. Archived from the original on May 8, 2014. Retrieved May 24, 2007. ^ a b Osovski, Skylar (March 7, 2013). "5 projects attached to Zach Braff". Norfolk Daily News. Archived from the original on July 1, 2013. Retrieved July 1, 2013. ^ Leopold, Todd (September 26, 2008). "Singer has some fame, but no 'Zach Braff effect'". CNN.com. CNN. Archived from the original on May 8, 2014. Retrieved September 26, 2008. ^ Lester, Paul (March 16, 2007). "Frodo gets funky". The Guardian. London. Retrieved September 26, 2008. ^ "Braff Busted Beating Up Teen on 'Punk'd'". Hollywood.com. September 14, 2006. Archived from the original on January 3, 2013. Retrieved July 1, 2008. ^ ""Punk'd" Episode #4.3 (2005)". IMDB.com. March 20, 2005. Archived from the original on December 10, 2013. Retrieved April 15, 2007. ^ Kepnes, Caroline (May 23, 2007). "Dane Cook: Employee of the Month. I'm Serious". E! Online. Archived from the original on September 30, 2007. Retrieved May 24, 2007. ^ Goldberg, Matt (May 21, 2009). "Zach Braff hangs with SWINGLES". Collider.com. Retrieved September 16, 2009. ^ "Heart of Stone post". Facebook. Retrieved April 5, 2010. ^ a b Adler, Shawn (September 7, 2007). "Can This Love "Last"?". MTV Movies. Archived from the original on May 9, 2014. Retrieved April 15, 2007. ^ Murray, Rebecca (September 8, 2007). "Zach Braff Discusses Fletch Won". About.com. Archived from the original on December 10, 2013. Retrieved April 15, 2007. ^ Lavallee, Eric. "The High Cost of Living". IonCinema. Archived from the original on April 6, 2012. ^ "Trust Star Zach Braff on His Wild New Role and Life After Scrubs". Broadway.com. August 16, 2010. Archived from the original on March 17, 2012. Retrieved March 31, 2011. ^ Bacalzo, Dan (August 2, 2010). "Second Stage's Trust, Starring Zach Braff and Sutton Foster, to Extend Through September 12". Theatermania.com. Archived from the original on August 7, 2010. Retrieved March 31, 2011. ^ Healy, Patrick (June 1, 2010). "Zach Braff to Star Off Broadway in 'Trust'". Artsbeat.blogs.NYTimes.com. Archived from the original on October 3, 2012. Retrieved March 31, 2011. ^ Hetrick, Adam (March 9, 2011). "Zach Braff's All New People Will Debut at Second Stage This Summer". Playbill.com. Archived from the original on December 10, 2013. Retrieved March 31, 2011. ^ "Zach Braff". Facebook. Retrieved March 31, 2011. ^ "All New People". All New People. April 30, 2012. Archived from the original on December 10, 2013. ^ "Open Hearts Movie - Zach Braff to Direct Open Hearts - About.com". Movies.about.com. Archived from the original on May 8, 2014. Retrieved April 5, 2010. ^ Jagernauth, Kevin (2011-04-21). "Sean Penn Was Set To Star In Zach Braff's 'Open Hearts' Before It Fell Apart At The Last Minute". IndieWire. Retrieved 2018-02-27. ^ "Hi friends. Enjoying a pretty day in Los Angeles..." Facebook. July 14, 2009. Retrieved October 30, 2010. Hi friends. Enjoying a pretty day in Los Angeles. I'm working everyday on a script called "Swingles" that I'm gonna direct and act in starring the beautiful and Very Funny Ms. Cameron Diaz. ^ Sciretta, Peter; grez868 (May 21, 2009). "Braff to direct and star alongside Cameron Diaz". slashfilm.com. Archived from the original on June 28, 2010. Retrieved October 13, 2009. ^ Ng, Shelley (November 17, 2009). "Mermaid Oyster Bar". Pix 11 Morning News. Archived from the original on November 23, 2009. ^ Meline, Gabe. "Zach Braff Saves the Rio Theater in Monte Rio". Bohemian / Boho Blog. Archived from the original on May 8, 2014. ^ "Harold Braff Obituary - Livingston, NJ". Dignity Memorial. Retrieved 3 December 2018. ^ "Harold I. Braff". Margulies Wind. Retrieved September 7, 2015. ^ "PAIRS NEW JERSEY - Elaine and Hal Braff, PAIRS Master Teachers". Smart Marriages. Archived from the original on May 18, 2013. ^ a b Keaney, Quinn (September 19, 2017). "9 Guys Mandy Moore Has Let Into Her Wild Heart (Excluding Jack Pearson)". PopSugar. ^ a b "Mandy Moore's Dating History - Zach Braff". E! News. ^ Barker, Olivia (July 21, 2014). "Why Zach Braff 'didn't like' dating Mandy Moore". USA Today. ^ Van Luling, Todd. "The Wild And Sometimes Frightening World Of 'Punk'd'". Huffington Post. Retrieved 10 December 2017. ^ "Zach Braff Busted Beating Up Teen on 'Punk'd'". Hollywood.com. September 14, 2006. Archived from the original on October 29, 2014. Retrieved September 26, 2014. ^ "I AMA Zach Braff. • /r/IAmA". reddit. Retrieved 2016-03-19. ^ "Zach Braff's love of flying". Bestlifeonline.com. Archived from the original on February 6, 2010. Retrieved April 5, 2010. ^ Myers, Laura (July 28, 2012). "'Scrubs' stars hit Las Vegas to register voters". Las Vegas Review Journal. Retrieved July 31, 2012. ^ Fox, Lauren (2012). "Zach Braff Fed Up With Republican 'Lies'". 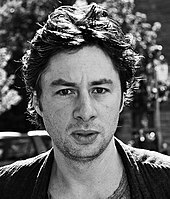 Wikimedia Commons has media related to Zach Braff.